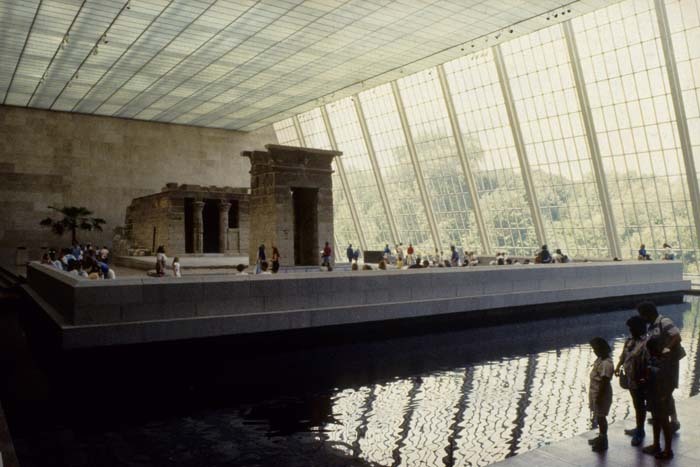 Kevin Roche John Dinkeloo Associates Architects, interior of Dendur Room, 1978, Metropolitan Museum of Art, New York. Manhattan Atmospheres traces the rise of the late-modern, architectural interior as a key site of environmental production and support within crisis-era New York (1965–1985). Within these interiors, corporations, institutions, architects, engineers, and landscape architects seized upon the architectural environment's myriad physical characteristics—its sealed interior atmosphere, stable temperature, and calibrated humidity—refashioning these features into a bio-physical project for the city's imagined future. The interiors of these buildings continued the natural project of New York City but in a new, architecturally inflected form. David Gissen is associate professor of architecture at the California College of the Arts. Gissen is the author of the book Subnature: Architecture's Other Environments (Princeton Architectural Press, 2009) and editor of the "Territory" issue of AD Journal (2010). His essays and research are published in journals such as AA Files, Grey Room, Casabella, Domus, Cabinet, Log, Quaderns, Volume, the Journal of Architecture, and the Journal of Architectural Education; books such as Design Ecologies (Princeton Architectural Press, 2009), Writing Urbanism (Routledge, 2008), Air (MIT Press, 2011), Coupling (Princeton Architectural Press, 2011), Landform Building (Lars Mueller, 2011), and Imperfect (Canadian Centre for Architecture, 2012).